For his latest trip Down Under, BTN editor Richard Cawthorne flew Business Class with Cathay Pacific from Heathrow to Hong Kong and then onward to Perth, the capital of Western Australia. Cathay Pacific’s Business Class has been widely acknowledged as one of the best, but competition is growing as more and more carriers beef up their premium product. For the moment, the Hong Kong flag carrier is holding its own and the regular arrival of new aircraft, principally long-range Boeing B777s and Airbus A350-900s, is keeping up the momentum. The Heathrow – Hong Kong leg, Flight CX252, of this latest trip was operated by one of the B777-300ERs, noticeably bright and shiny at the gate in Cathay’s streamlined livery. Hong Kong – Perth, CX171, upped the game further with an obviously-new A350-900. Smooth check-in formalities and a chance to relax in the respective Business Class lounges were as expected. The nearly-new Heathrow lounge in particular is a model of its kind. In Terminal 3 departures by Gate 11, it opens at 05:30 and provides food including Cathay’s trademark Noodle Bar, plus alcoholic and non-alcoholic drinks. Other features include wi-fi, plus workstations, luggage storage, newspapers and magazines, shower facilities, washrooms and wheelchair and disabled access. 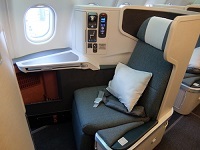 Initial quibbles with the finish quality of the Cathay Business Class seat, a development of US manufacturer Zodiac’s Cirrus III model, appear to have been overcome and 25K on the Boeing and 17A on the Airbus, both window seats, worked perfectly. The recline to a fully-flat 2m (6ft 5in) bed is a three-button procedure, with one button for the backrest, another for the main part of the seat and a third for the footrest, which makes the whole thing easily customisable. It’s not all good news however – on the Airbus, the control panel is over a passenger’s left shoulder, making it awkward to reach. And while the entertainment options, including 200 films, TV programmes, games and music channels, are fine, Cathay is lagging behind some competitors in the inflight wi-fi stakes. The new A350s come fitted with the Ku-band satellite kit, but the system is not due to be rolled-out across the rest of the wide-body fleet until the middle of this year. For the moment, on the A350s unlimited internet for regional fights of less than 6hr costs US$13; for flights of more than 6hr it is US$20. One-hour slots are US$10. The Business Class cabin itself is immediately familiar, with the reverse herringbone pattern in a 1x2x1 layout for direct and uninterrupted aisle access for every passenger and the seats angled away from the aisles for privacy. BTN had a window seat on each of its flights, which among other things allowed a great view of sunrise over Hong Kong the morning after our departure from Heathrow and of the long approach to Chek Lap Kok Airport. While all the seats boast a large amount of space within their cocoons, window seats also feel particularly light and airy. For passengers travelling together who want to chat, the two middle seats are angled towards one another but still retain their individual privacy. Within the space on all the seats, a fixed side table is convenient for drinks and infight essentials and has a foldable dining table underneath that swings out for meals. There is also a retractable armrest on the outside of the seat that can be lowered for additional room or raised for increased privacy. 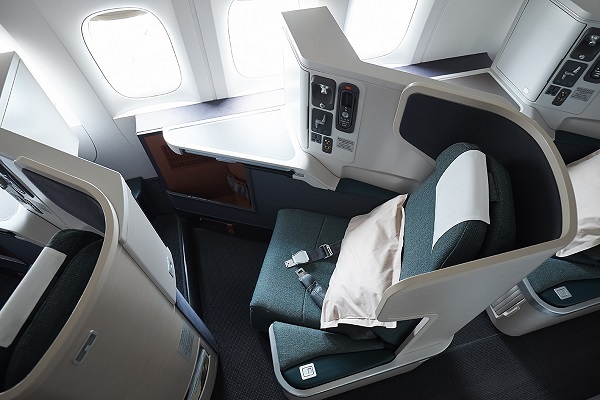 Cathay notes that the seat is also designed around productivity, with the privacy partitions, wide tables, power outlets and adjustable lighting all enabling passengers to spread out uninterrupted while they work. A panel to the side of the seat contains controls, power connections and a storage compartment for headphones and has a door which can be fastened closed and used as a cubby hole for mobile phones and other bits and pieces. Each seat also comes with fluffy pillows and a soft-fabric duvet in the interests of relaxation and restful sleep. Set off by the welcoming glass of champagne, the Business Class menu incorporates locally sourced sustainable and in-season ingredients, with Cathay noting it also offers lighter and healthy dining options. Lunch choices on Heathrow – Hong Kong included mixed salad with fig vinaigrette among the starters and braised chicken with yu hsiang chilli sauce, Shanghainese pak choy and steamed jasmine rice. Breakfast came with the proper Swiss version of muesli as well as fresh fruit and a choice of omelette, vermicelli and congee. 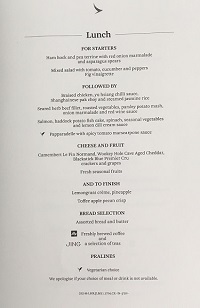 Dinner on the evening Hong Kong – Perth flight also featured a salad plus a marinated prawn dish as starters with pan-fried sea bream or rigatoni among main courses. Cheese and fruit, desserts, breads and tea and coffee were also available on both flights, all served politely and efficiently with an award-winning selection of wines and other drinks accompanied by fine chocolates to complement it all. The Business Class amenity kit has been created by Seventy Eight Percent, a Hong Kong-based company noted for quality designer bags “for globetrotting professionals” (their words, not mine). The long-haul kits feature natural skincare products from Jurlique including balancing day-care cream for flights outbound from Hong Kong or moisture replenishing day cream for inbound flights, citrus hand cream and lip-care balm, plus toothbrush, toothpaste, eyeshade, shoe horn, earplugs and socks. Men also get a shoe horn, while women have cotton pads. All told, Cathay Business Class delivered exactly as advertised. Despite some recent financial hiccups, the airline is on a roll, thanks largely to its new fleet and more to come. More than 20 A350-900s have arrived over the past two years and 26 larger and longer-range A350-1000s are in the pipeline. Cathay is also continuing to grow its network by launching pioneering nonstop routes, the latest of which, just announced, will be a four-a-week service between Hong Kong and Washington DC later this year. Earmarked for the A350-1000, it will become the longest route on the airline’s network in terms of distance at 13,122km (7,085nmi) and complement existing routes to the US East Coast, including Boston and New York’s two main international airports, JFK and Newark Liberty. It’s a firm answer to critics who accuse Cathay of falling behind and a possible riposte to Australia’s ascendant flag carrier Qantas, which is challenging on the lucrative market between Asia and its home country. Among other things, Qantas is about to launch non-stop service including an upgraded Business Class product between London and Perth using its new Boeing B787-9 Dreamliners, now named the Quokka Fleet after one of Australia’s more endearing native mammals. 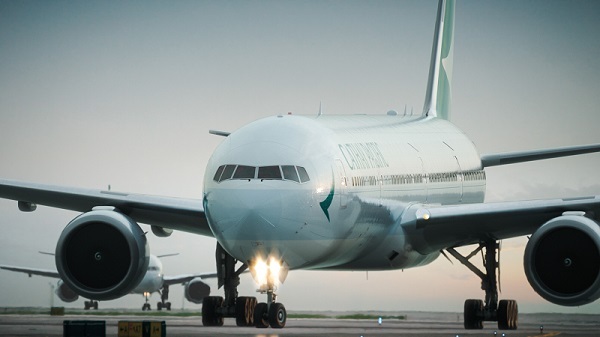 Interesting times are ahead, but for now Cathay is putting up a spirited challenge. Having your passengers arriving rested, well fed and relaxed in Hong Kong after a 12hr flight is still an achievement to be proud of. And with seat recline about to become a hot topic again, there is no argument for Business Class stronger than being able to guarantee the passenger in front of you is not about to recline into your lap.